A Paraisopolis-Dharavi Institute of Urbanology to be held next year, where architects and public servants come and learn from residents. URBZ senior adviser, life long Dharavi (Mumbai) resident and social activist Bhau Korde on the streets of Paraisopolis. URBZ is back in action on the streets of Sao Paulo! We are participating in an exhibition and cities-exchange event between Sao Paulo and 6 cities around the world. 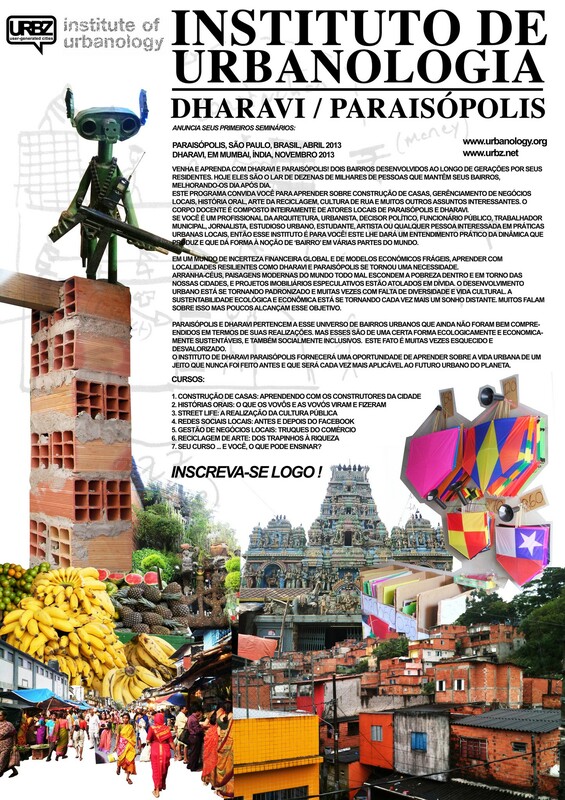 Initiated by Elizabete França, the director of the Secretaria da Habitação de Sao Paulo (which oversees more than 50 projects in various favelas) and curated by Italian architect Stefano Boeri, Sao Paulo Calling invites practitioners from Mumbai, Baghdad, Rome, Medellin, Nairobi and Moscow to 6 favelas in Sao Paulo to present their work, organize workshops and meet residents and community leaders. 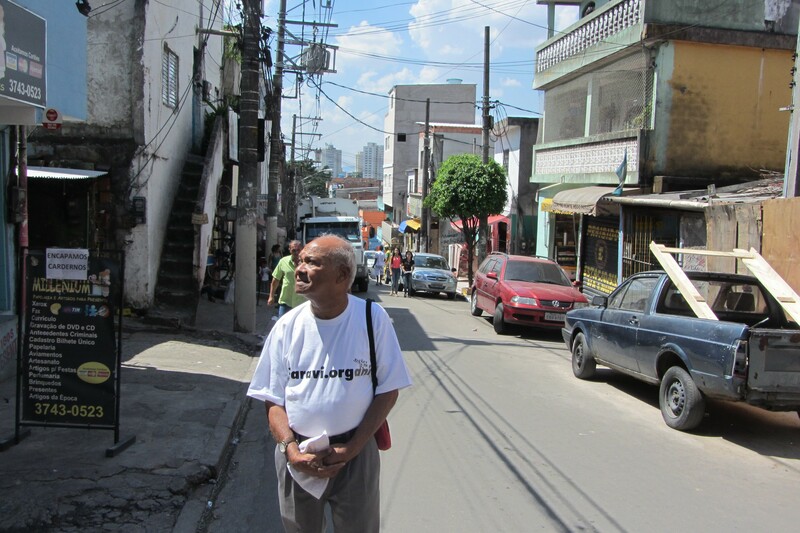 The event was launched last month at the Centro Cultural São Paulo and then at the favela of San Francisco. This weekend Mumbai meets Sao Paulo in Paraisopolis. We came with a special guest from Mumbai, Bhau Korde who has been a source of inspiration and guidance to the URBZ team since its inception. He will engage in debates and discussions with residents of Paraisopolis, this coming Saturday and Sunday. In addition, we are organizing a street exhibition on Dharavi, displaying 40 large posters showing scenes of every day life throughout the neighbourhood. We are also organizing a 3-day workshop on local construction practices with students of the Escola de Arquitectura de Sao Paulo. The students will be studying houses built by local masons (pedreiros) in Paraisopolis and learning directly from them. As part of our Dharavi-Paraisopolis exchange we are also proposing a Paraisopolis-Dharavi Institute of Urbanology to be held next year, where architects and public servants come and learn from residents (see poster). The start of a collaborative initiative that seeks to interweave technical and scientific aspects of architects with knowledge of the local mason and the lifestyle of inhabitants. In collaboration with local pedreiro Ataide, the urbz team helps build a house in Paraisoplis right from digging the foundations. 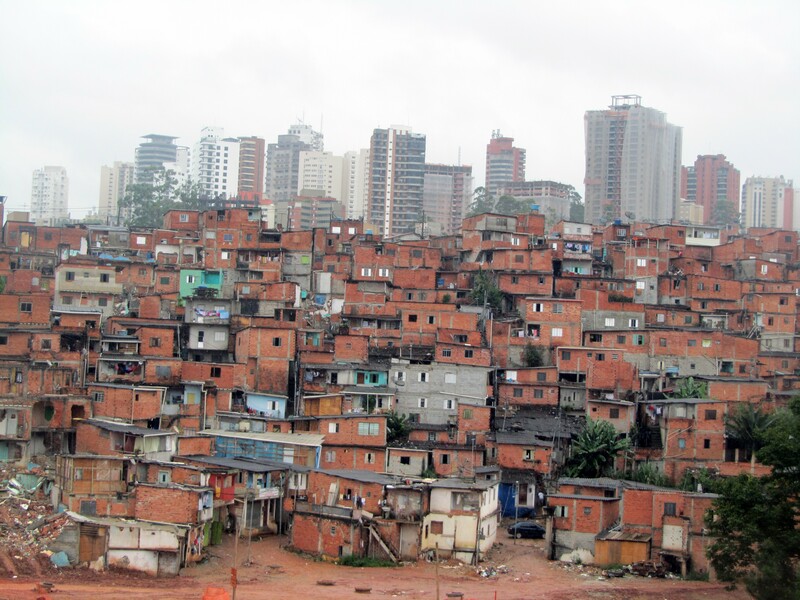 The connections we evoke between our work in Dharavi, Mumbai and Paraisopolis, Sao Paulo seem to have became a distinct new arc in this multi-city story. Our street exhibition in Brazil mashes up landscapes from Dharavi and Paraisopolis leading residents to guess which part of the image is their neighbourhood.